Celebrate National California Strawberry Day with tickets to a sweet adventure at the 33rd Annual California Strawberry Festival. One of the top outdoor festivals in the nation with proceeds benefiting charities, it's ripe for fun. 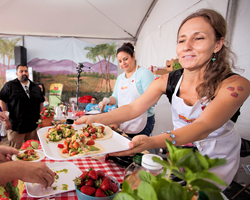 Strawberry revelry is ripest when the 2016 California Strawberry Festival celebrates its 33rd seasonal celebration May 21 and 22, 2016 on 15 picturesque acres at Strawberry Meadows of College Park in Oxnard. It’s an iconic berry event of epic proportions. Ranked nationwide among the top outdoor Festivals, the fruity fete boasts lip-smacking strawberries every way imaginable, live concerts on two stages, more than 200 Fine Arts & Crafts booths, the Strawberry Promenade with celebrity cooking demonstrations, Strawberryland For Kids with rides and attractions, and wholesome, gooey contests, appealing to all ages. An estimated 1.5 million strawberries will be consumed over the weekend where the regions most prolific crop is the main ingredient for fun. If you haven’t had strawberry pizza alongside a strawberry beer, you haven’t been to the Festival. Or perhaps the strawberry nachos, strawberry funnel cake, strawberry crepes, chocolate dipped strawberries, or fried strawberries, are more your style. With selections from 50 food booths, those who wish to control their destiny should head to the “build you own” strawberry shortcake tent to pile on the goodness or enter the “Strawberry Shortcake Build Off” contest. Best of all, indulging is guilt free. With each bite of berry bliss from the non-profit food booths, 100% of sales support their causes. The formula has proved to be a fruitful enterprise with more than $4.5 million dollars benefiting a multitude of southland charities over the past decades. Where else can you throw strawberries at your best friend in the Tart Toss Contest, or eat a strawberry pie by literally putting your face in it at the Pie Eating Contest? Oxnard is located just 60 miles north of Los Angeles and 30 miles south of Santa Barbara. The free Park & Ride “Strawberry Express” shuttles from multiple convenient locations off the 101 freeway make getting there a breeze. Amtrak California offers a special Kids Ride Free promotion Festival weekend (shuttles meet the trains). Parking is also available on site for $10. Address: 3250 South Rose Avenue, Oxnard. California Strawberry Festival general admission is $12, seniors 62+ are $8, and children ages 5-12 are $5. Kids 4 and under are free. Active military and dependents with ID are $8. Hours are 10:am to 6:30pm. Tickets can be purchased at the gate or in advance at http://www.strawberry-fest.org. The California Strawberry Festival toll free information line is 888 288-9242.